Brennie, now Ollie was adopted in 2014 by Jessica and family. He had been found in the cold after wandering for days and being abused and starved. Jessica says “His foster mom and dad did an amazing job at bringing him back to good health and showing him a healthy way of life! When he went to his forever home, he adjusted well and made himself right at home! Once Ollie learned how to play with toys, he made everything his toy! He loves to cuddle and rest, dog park visits, hiking in the trails and long walks. 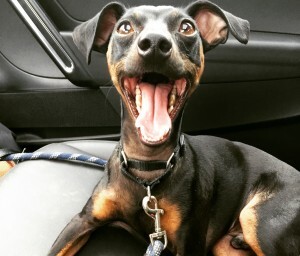 He is so happy to have a forever home and is fiercely loyal to his humans. He loves to play with other dogs, especially his girlfriend Maya! And he never tells her that she is too big.” From cold to cuddled!